The Western Campus Site Improvements project will help to integrate new development seamlessly with the existing fabric of both the Western Campus and the greater Oxford campus. The primary emphasis of the Western Campus Site Improvements project is on strengthening the pedestrian experience and pastoral park-like feel of the Western Campus. 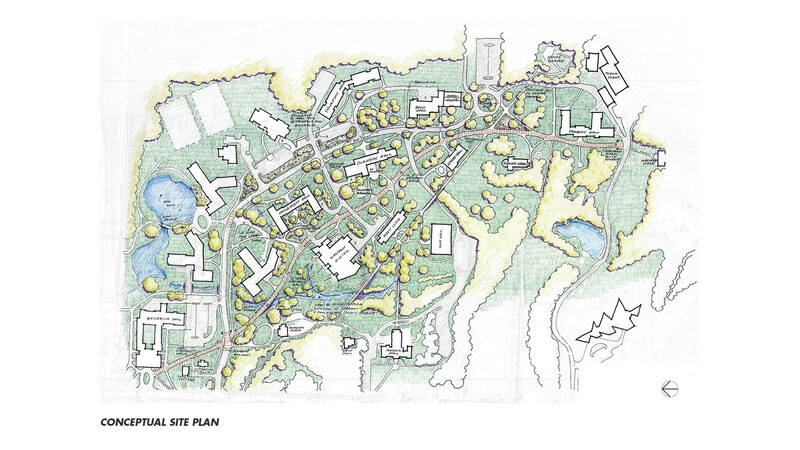 Also imperative to the plan is providing a clear pedestrian circulation hierarchy for the campus that respects existing and proposed view corridors, while controlling pedestrian desire lines. One fieldstone arch bridge and one ornamental steel bridge will also be constructed for pedestrian connections back to the main campus. The continued enhancement of the stormwater management for the campus will be an integral component in creating the park-like experience. Roughly one-third of a mile of existing overgrown and eroded stream bank will be restored as part of this stormwater management effort. Planting native flowering understory trees, shrubs and perennials will enhance the woodland aesthetic and visual connectivity of the campus. At the south end of the Western Campus, vehicular circulation is being reconfigured to accommodate the main pedestrian walk as the primary circulation through this end of campus. This is a transformative move for the University that will better connect the far end of campus with the new campus core.